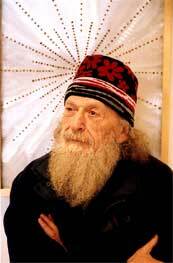 Bill Anhang's work might be summed up as the physical depiction of "chaim l'olam" (eternal life). He first draws us in with an innovative use of light that is nothing less than a new artistic dialect. On closer examination we encounter in his work intensely familiar fragments of the western art vocabulary combined with decidedly unfamiliar ones. The overall effect is entrancing, jarring and perplexing, as it must be to accomplish Bill's objective of transforming our perspective, changing our habits of seeing and our sense of the possible. His art counterpoises orthodoxy and radicalism, the analog past and the digital now, and time-honored conventions and futuristic sensibilities. It bridges the mundane world of two-dimensional pictorial representation and a spirituality-laden, optical-fiber-illuminated place of awe and infinitude. Bill's pieces incorporate found images that imbue his art with a strong sense of historicalness, but that in his art achieve an air of timelessness. In the end, what Bill's work articulates is the eternal, and what it achieves is to connect this world to the next one. "Anhang, born in Poland to Jewish parents escaped with his family to Manitoba in 1939 and subsequently moved to Montreal in 1960, where he has lived since. 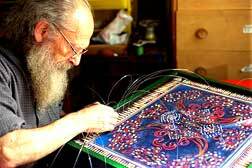 Working as an electrical engineer till the quit his job in 1973, he then began creative projects that took on proportions far beyond the casual art enthusiast. With no formal training, but simply listening to advice to follow his creative impulse, his home was converted in the next few years into a theatre of operations from which his visionary and complex projects have been produced for more than 25 years." W. Anhang weaving fibre optics. "Often a works begins with a message or historical reference in mind, be it 'the demographic history of the Canadian people' or the reworking of the last supper. An image might be lifted from a reproduction, altered in a computer graphics program, and laser printed onto canvas. Then through points determined by the artist, an elaborate pattern of led and fiber optic wires will be woven into the canvas and wired into an external microprocessor from which complex flashing light patterns are generated. Finally, the work will often be painted and altered by long time collaborator Glen Luckock the result is an object of visual density and dizzying activity. Now, consider hundreds-literally-objects and projects having been produced and accumulated over the course of more than two decades, and you have billsville... to put it mildly, it borders on crazed activity, brilliance, naiveté polymorphous intelligence and inventiveness of a truly independent nature." "Like le Douanier Rousseau who never traveled far from his Paris neighborhood yet painted exotic far away jungle scenes, Bill Anhang is an earthbound, inter-planetary naïf. He has never fit into any category of formal art, or anti-art, or art. His particular vision is like a gymnasium performance, something portable and pragmatic, but also mysterious and with hidden dimensions." David Blatherwick © 2003, Raw Vision Magazine Montreal.